Perhaps I owe readers who have better thing to do than keeping an eye on the eccentricities of Anglicanism a word of explanation about the 'Ebbsfleet Apostolic District'. It is one the groupings in England of those who have been deserted by the movement of the official organs of the Church of England away from Catholic Faith and Order. It consists of some hundred parishes in the South Western segment of England ... which makes it a fair size bigger than some American and Irish dioceses and possibly than the entire Scottish Episcopal Church. It takes its name from the Ebbsfleet which was the landing place of S Augustine before he got to Canterbury and founded his See there. So it points to the time before there was such a thing as the Church of England, but when a great Roman Pontiff had sent a diffident group of Roman monsignori to bring the Faith to a provincia (Brittania) which had lost it. We accordingly venerate pope S Gregory the Great as our Patron Saint. The implications of all this will not be lost upon the thoughtful. I appreciate the puzzlement Roman Catholics must feel that Christians who are so very orthodox (and believe me, we are) are in a canonically anomalous situation as far as the ancient Churches of East and West are concerned. But I would ask them to do two things: to give us the benefit of the doubt; and to read Aidan Nichols' book The Panther and the Hind. And possibly also to recollect that there are are parts of the Roman Catholic Church where the teaching emerging from local archbishops is a great deal less orthodox than that coming from the present occupant of the See of Canterbury. I seem to recall that not so very long ago one American RC archbishop was such a problem that Rome had to send a coadjutor to administer those parts of archdiocesan life that particularly related to orthodoy and orthopraxy; His Grace wasn't safe enough to do it. What particularly upsets us sometimes is that there seem to be but two sorts of RCs. There are those whose heresies startle us and, imperceptive fools that they are, think they can endear themselves to us by whispering in our ears how the present Pope is wrong about nearly everything, but, not to worry, he will soon be followed by another one who will be as gloriously heretical as anybody could wish. The other sort of RC is the one who shares the faith which we hold, but because he has (rightly) come to see the problems of 'ecumenism' as it is often understood, seems to need to treat us with contempt instead of as brothers-in-arms. May I add a personal and emotional point? We have been in existence for less than two decades, but already we have a history and an institutional life which is immensely dear to us. Newman, in his sermon on the Second Spring, foretold that the glories of the old English Church had passed away, but that Pio Nono's new sees would soon be 'names as musical to the ear, as stirring to the heart, as the glories we have lost, and saints shall rise out of them ...'. We feel a bit like that. There have been three bishops of Ebbsfleet, all of them men to suggest the words of the Latin anthem Ecce Sacerdos Magnus. I had the privilege of close friendship with the first; he and his successor died worn out by hard work for the Catholic Faith. Our present Pontiff is also a man who has not spared himself in witnessing to Catholic Truth; as far as he is concerned, the liturgical formula that springs to mind is a Byzantine one, eis polla ete, despota. What a joy to be with our 59-year-young bishop for the Chrism Mass last night, and in the Chapel of Pusey House. The beauties of the Palestrina Mass seemed to be echoed in the particular sweetness of the incense rising above the Altar of Sacrifice: how well everything always is sung and done under Father Jonathan's beneficent rule. And that moving moment when the Pontiff leans over and breathes upon the Chrisma. Such things can easily be dismissed as rather embarrassing medievalisms. Far from it. The bishop, in S Ignatius' words the tupos tou Patros, the 'expressed likeness of the Father', breathes forth the Spirit just as the Eternal Father breathes forth the Eternal Spirit which proceeds from him in the economy of the Blessed Trinity (let us not digress into what this might imply about filioque). This detail is a potent sacrament (I use the term in a prescholastic sense) of the sole arche of the Father and the procession of the Spirit, and like all sacraments it visibly expresses what invisibly it contains. 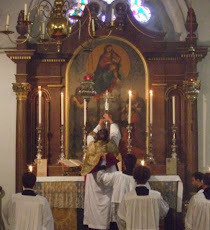 And the Chrisma itself is also a just such a sacrament. S Cyril of Jerusalem writes 'Don't have an underlying thought that this is plain Ointment. For just as the loaf of thanksgiving (eucharistia) after the calling-down of the Holy Spirit is no longer ordinary bread, but the Body of Christ, so this holy Ointment is after the calling-down no longer simple (psilon) or as one might say common (koinon), but the gracious gift (charisma) of Christ and of the Holy Spirit, by the presence (parousia) of his godhead made operative within us' (or, as some scholars punctuate it: 'of Christ, and made operative within us of the Holy Spirit by the presence of his godhead'). This passage is set in the Office of Readings for Friday in Easter Week; how suitable to read in that season the catechesis of the neonati, the newly baptised, composed by so great a mystagogue. But, intriguingly, the Liturgia horarum omits the passage I have printed in bold. I have my suspicions why. The Eucharistic loaf becomes, is transsubstantiated, into the Body of Christ. The oil for the Chrism is not transsubstantiated into, for example, the Holy Spirit in the same simple one-for-one sort of exchange. Modern Western Christians thus make a clinical, black-and-white distinction between Sacraments and Sacramentals; we say that the contents of the Chalice are the Blood of the Redeemer; the contents of the Holy Water stoop are no more than water. This is a good rule-of-thumb but it can miss some of the subtilties and nuances which a broader reading of the Great Tradition can give us. The Chrisma is not just something like Holy Water or even the Oil for the Sick. That is why Bishop Andrew blessed the Oil for the Sick in a simple way just before the the sentence per quem haec omnia of the Canon Romanus, which is where all manner of ordinary goodies used once to be blessed. But the Chrisma was consecrated later and with a prayer chanted in the same way as the chanted parts of the Eucharistic Prayer, and even with the 'eucharistic' structure: God's Great Deeds are rehearsed, and then Te igitur leads into the request for consecration. If I were a critical nit-picker, I would suggest that the omission in the 'new' breviary of those clauses from S Cyril constitutes an example of that introduction into the 'new' Liturgy of 'Enlightenment' oversimplifications which Aidan Nichols and Catherine Pickstock have taught us to deplore. It just shows that when saying the 'new' office it's important to have the Patrologia Graeca in one's back pocket as a crib to the Latin. Yes, I obviously hadn't read enough of him when I wrote the first edition of that rash post. I had found myself in some sympathy with what he said about the risks of an attack on Iran precipitating a third world war; and it had occurred to me, before he wrote his piece on praying for the Jews, that excluding Jews from the preaching of the Gospel would itself be an act of antisemitism. I accept that my correspondents have been more careful than I was; that their accounts of his views are better researched than mine was; and that, to put it mildly, the gentleman has said some strange things. I should have been more specific in what I wrote. Although my words were not exactly an endorsement (I did use the terms iffy, dodgy, barmy) I do realise that the levity of my flippant tone was ill-advised. Sorry. I'll try to grow up. The first ORDO UPDATE: yesterday I saw in Blackwells a volume (Anglican) called Common Worship: Festivals. Possible purchasers should be warned that it contains two types of material: (1) Stuff already authorised by the General Synod; so, if you've already got the basic Common Worship, you won't find any new authorised material. (2) Stuff composed by the Liturgical Commission and recommended by the bishops but not actually authorised for use. It is provided for the officiating minister to use in accordance with canonical his right to make, on his own authority, changes which are not of substantial importance. Thus, this stuff has no more legal authority than what a priest might draft himself or borrow from, for example, the Roman rite, the Syro Maklankara Rite, or whatever. Frankly, I don't like the contents of this book. Modern Anglican Liturgical Commissions rarely provide material from such sources as the ancient Roman Sacramentaries; they have too much self-confidence to miss the chance of composing a lot of verbose and pretentious stuff themselves. For example: this volume provides a lot of Prayers At the Preparation of the Table. This could have been an opportunity to offer translations of Orationes super Oblata from the early centuries. But did they, hell? Even for Corpus Christi, they couldn't bring themselves to use or adapt that wonderful prayer by S Thomas A, in which we ask the Lord to grant his Church the gifts of unity and peace which are mystically designated under the eucharistic elements. Best to wait for the new translation of the Roman Rite to be authorised. More about the Charta (see previous blog) in Fire and light in the Western Triduum: their use at Tenebrae and at the Paschal Vigil; by A J Macgregor; pub The Liturgical Press; ISBN 0-8146-2066-3. Hooray for the Congregation for the Doctrine of the Faith! I used to say that quite often, but this is the first time I've said it since my favourite dicastery came under new management. Baptism 'conferred' with any other formula than Father, Son, and Holy Spirit, is to be deemed, not doubtfully valid, but certainly invalid. CDF has said so. The reasons for this decision are, of course, obvious to students of the New Testament. As the 'Name' of the First Person is Father (witness most of the New Testament and especially John 17), and his Son is his Son, non-gender-specific substitutions ('Creator, Redeemer ...' or whatever) clearly represent indicate initiation into something other than Christianity. But the ecumenical implications of this are enormously important and need to be taken account of immediately. Not that the CDF was trespassing on the territory of the Pontifical Council for Christian Unity. The decision was necessary because errant clergy within the RC Church have been messing around with this feminist bilge. But if Fr Naughty O'Sullivan cannot validly confer the sacrament by such a formula, neither, obviously, can non-RC ministers. And my suspicion is that such hanky panky has been going on for some time in some Anglican circles and, probably, all the more so among non-conformists. It is also obvious that although, predictably, some RC clergy have been doing it, it is likely that the disciplinary structures of the RC Church will be more able to restrain such abuses within the Roman Communion than outside it. A decade ago it was reported that the woman dean of an Anglican cathedral 'baptised' using some such formula; a couple of months ago, television appeared to show a (male) priest in Sussex baptising 'in the name of the Spirit'. And, while we're on the subject of baptismal validity, I supect that protestant ministers cannot be relied on to use adequate matter; I have seen on television a presbyterian minister 'baptising' by marking the forehead of a baby with her damp thumb. Two implications. Firstly, I imagine it would now be prudent praxis when people enter the RC Church not to assume that non-Catholic baptism is valid. Either inquiries could be made into how baptism was conferred at a given time by a particular minister, or given the practical problems involved in that, Baptism could be conferred sub conditione, just as it used to be before the ecumenical movement. Perhaps this is even more necessary with regard to baptisms since, say, 1990 ( before when protestants were more inclined to operate on the endearing old protestant principle that if our Lord commanded something in the text of Scripture he should be obeyed). Secondly, and more broadly, we should remember that the Ecumenical Movement is based on the notion that all Christians share a common baptism. That assumption cannot now be made. Just as adherents of the New Religion insisted on Women Priests although this created doubt about the ordination of a great percentage of those in the Anglican ministry and accordingly ruptured communion within the Anglican family and soured relations with the ancient churches, so they are now introducing the same doubts into the practice of Baptism. Their attitude, in the latter as well as in the former case, is that their novel dogmas are so peremptorily important that they must be given immediate effect however grave the effect is on what used to be considered the imperative of Christan Unity. Has an important moment of truth now arrived? I do hope so.